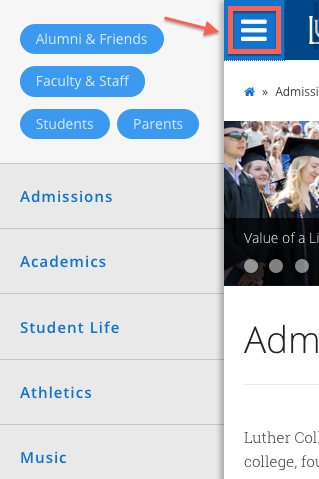 Navigation is a key aspect of information architecture. The quality of the navigation determines a user's ability easily to find content. 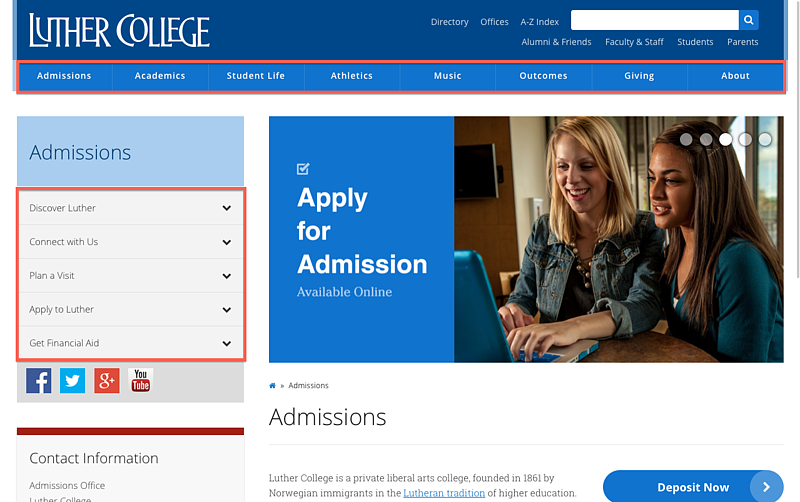 Luther College websites utilize top level Shows Children pages that act as expandable sections or categories for related web content. These top level pages are only accessible through breadcrumbs and should be kept blank. To change a top level page to a section or category, change the page type to either Shows Children or Shows Children with First Images. Our website has a left sidebar navigation convention for individual sites. Users start looking from the top. Therefore, it's best to put the most important most frequently accessed pages at the top. The navigation is not the place to get creative. Use conventions when possible (e.g. "About," Contact," "Mission") and try to make the navigation labels as obvious as possible. User testing can help determine if you are using the correct labels. If there are too many top-level pages in the left navigation, users are not able to scan quickly for information. We recommend no more than six top-level pages. Regular pages can have child pages (pages under them). This is a nice way to organize large quantities of content without overwhelming the navigation. You can see an example of child pages in the navigation on the left or under the "hamburger icon" on the top right of your screen, if you are on a mobile device. Do not add child pages in more than one place in the navigation. This is called polyhierarchy, and it's generally confusing to users. We do not recommend adding temporary pages (e.g. annual events, special fundraising drives, etc.) to the main navigation. A better way to call out these types of events is to add a feature on the homepage and potentially add a call-out in the sidebar. Avoid linking out to other websites from the left navigation. This is disorienting to users. Learn more about information architecture and navigation best practices in the article "Top 10 Information Architecture (IA) Mistakes." 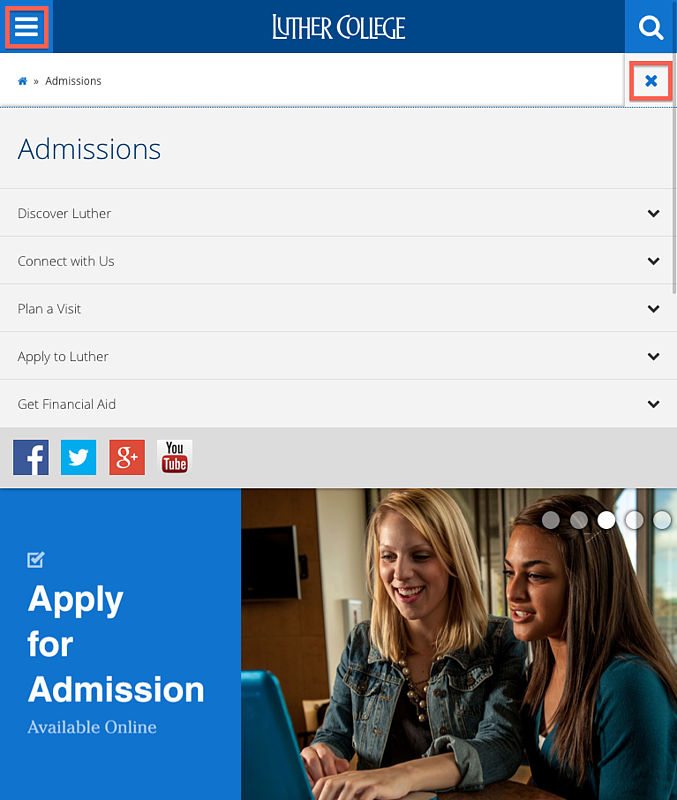 Mobile view of www.luther.edu with closed menu. 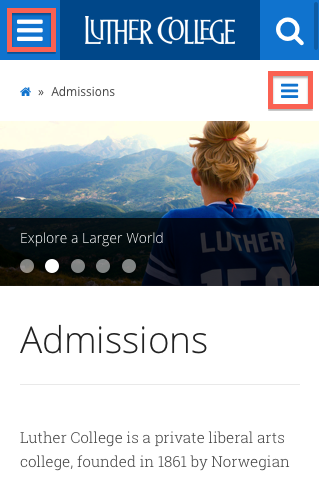 Mobile view of www.luther.edu with open menu.